If Jesus were on Earth today, I think He would be in Southeast Louisiana helping with flood relief: Jesus calls us to go, that’s why we went. To put this into perspective, Hurricane Katrina, by comparison, dumped about 2.3 trillion gallons of rainwater in the state (though more in other states). The flood also dumped more water than Hurricane Isaac and is being called the worst United States national disaster since Hurricane Sandy by the Red Cross. According to the National Weather Service Hydrometeorological Design Studies Center, the amount of rainfall in the hardest-hit locations had a less than 0.1 percent chance of happening. Clayton King has deep roots in Louisiana, preaching his first message at a three-day revival at Denham Spring Baptist Church in 1992. Since that time, our ministry has formed countless friendships and relationships with a number of churches across the state. Just this past summer, we had 11 Louisiana churches attend Crossroads Summer Camp and eight Louisiana college students serve as staffers including Ryan Dean Williams. Ryan is a two-year summer staffer, and student at Louisiana State University. Ryan calls Denham Springs home, where his house took on three feet of water. Steven: How did you initially find out about the flood? Ryan: It was August 13th at 8 a.m. when our street began to flood. My Dad called to get us home as soon as possible. Our house is the highest point in our neighborhood, so we knew once the streets flooded, we were stuck there. At noon, the water reached our front porch and our three family cars were flooded (and now totaled). It all happened so fast! By 2 p.m. the water was in our house rising to the countertops. We moved as much as we could to the second story with the little notice we had to make it all happen. We were told the flooding was supposed to subside, but it didn’t. As the hours went on, the water continued to rise later causing our refrigerator to topple over creating a dangerous risk of electrocution. We waited and waited, but no one came. It wasn't until the next day that the cajun navy rescued us in their personal boats and took us to dry land. Steven: What did this mean for your family the next couple of days? 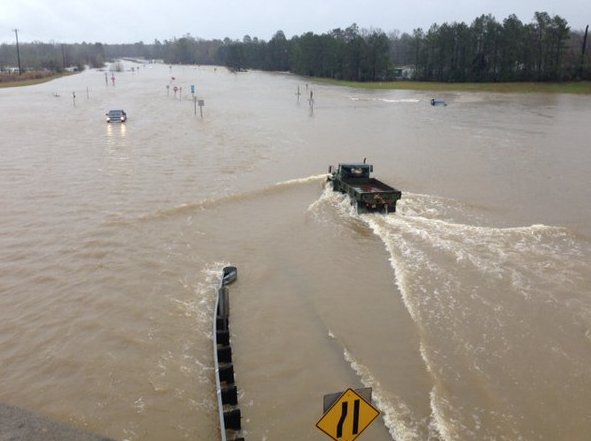 Ryan: After we were rescued by the cajun navy, like so many of our neighbors, we were stranded at a gas station for 10 hours until the military could carry us out on an army truck. I think we returned home to begin repair on August 17th. Steven: How has the community come together? I was surprised by the outpour of support from our community! People that didn’t even go to our church, that we barely knew, were showing up to gut our house. With little media coverage, because of the Olympics, there was very little help from the government. It was the communal church that stepped in and started helping right away. It was really cool to see churches become THE CHURCH! As a whole this has been very hard on our community, but we are surviving. Tragedy changes your perspective. People are rallying around one other. We are choosing to value one another over our possessions. "Tragedy changes your perspective. People are rallying around one other. We are choosing to value one another over our possessions." Steven: What is the greatest need? Ryan: There are still houses that haven’t been touched. There’s a large population of elderly people that cannot do any of this strenuous work themselves. There are also a lot of people that have gutted their homes, but have no money to rebuild. Donations of all kinds are welcome, especially furniture, financial donations and man power. Teams of more people to help rebuild would be Godsend! Before even being alerted by a news source, we began to receive personal messages from our friends in Louisiana about the flood. Our hearts were unsettled. We began to pray and fast, but nothing seemed to be enough. Our people were hurting. They needed help. We decided as a team, "Let's just go!" While it seemed crazy to turn around a trip in less than a week, we knew that everything holding us in South Carolina was far less demanding than the needs on the gulf. Our ministry team of 18 (nearly all of head staff, interns and three summer staffers) packed our bags to caravan South. We partnered with three families for housing and multiple mom's that rallied around the oven to feed our bunch! We also connected with Chick-Fil-A Owner & Operator Luke Cook (who also happens to be a former summer camp staffer and long-time ministry friend) to identify needs on the ground. He was able to connect with multiple churches to find families that desperately needed our help. Over the course of several days, we gutted six homes down to the studs in an effort to stop the spread of mold. I can speak for the entire group by saying we have never worked harder in our lives! I connected more when I was on the ground in Louisiana than I ever would looking at a computer screen. I learned a lot while we were there. Most importantly, learned that a tragedy is more than just losing stuff. These people had to part with memories, photos of grandchildren and wedding days, parting with family keepsakes that could not be salvaged. There’s something really special that happens when a group of people work together towards a common cause; a special bond is formed. Last week our cause was to be the hands and feet of Jesus Christ. I saw Jesus in each member of our team, in the host families, and in the members of the community who were eternally thankful for our help. We were united in sweat, claustrophobic face masks, the unforgettable stench of 2-week old swamp water turned mold, and the incredible stories of those we had the pleasure of serving. We have not committed to another trip to Louisiana, but we are seeking interest. If you would like to go, email us with your inquiry. If you are not able to physically go on a trip, but would still like to make a difference by donating financially, you can give here. Every dollar donated will be used to #RebuildLA. About the Author: Steven Cockerill is part of Crossroads Discipleship Home 11 and a new communications intern with our ministry. He's 21 years old and has worked on summer staff with us for three summers. He values friendship, and would rather listen than be heard. He has a passion for photography and enjoys a good hike.